Travis and Damien should forget about Grinds2Go™ and just invest in one of these babys for Alii Drive. 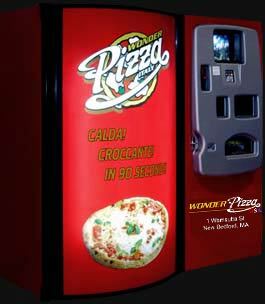 Wonder Pizza makes this vending machine that dispenses custom 9″ fresh-cooked pizzas in less than 2 minutes. Any chance for a beer vending machine to go with that? As a human being, I'm repulsed. As a guy, I'm stoked! Uhh … it's "Grinds on the Go, Brah."